Hibs boss Alan Stubbs today insisted he has his eyes firmly fixed on four play-off matches – not two. The Easter Road side will find out on Sunday whether they’ll be facing Rangers or Queen of the South in the battle to decide which Championship club will take on the Premiership’s second-bottom team for a place in the top flight next season. But, while admitting the play-off semi-final takes precedence, Stubbs is looking beyond those games, the head coach having already started building up a dossier on all the Premiership sides currently in danger. Fir Park was his destination twice in the space of a week to see Motherwell, favourites to finish in the dreaded play-off spot in the Premiership table, take on Ross County and then Kilmarnock – two clubs who are not yet assured of safety. Stubbs took in the first leg of the semi-final at Palmerston Park to see Rangers take a 2-1 lead into Sunday’s return at Ibrox – a game at which the former Celtic and Everton defender will again be in attendance to see at first hand who next Wednesday’s opponents will be. And, as he eyes those matches, Stubbs has received a triple boost with injury victims Farid El Alagui, Dylan McGeouch and Keith Watson all looking set to be available for this critical period. 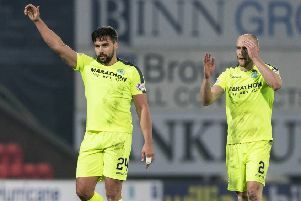 El Alagui, who missed the vast majority of the season sidelined with a ruptured Achilles tendon, spent the first day of Hibs’ training camp in the Spanish resort of La Manga working with the physios, the striker having missed the final game of the regular season with a knee problem which saw him consult a specialist. But he rejoined his team-mates the following day while Watson has been stepping up his rehabilitation in the sunshine having been out since the beginning of April with a hamstring problem. And McGeouch returned to full training before Stubbs took his squad abroad, having missed the final two games with an ankle injury.